Died from wounds received while gallantly leading his regiment, 17th United States Infantry, at the Battle of Santiago de Cuba, July 1, 1898, aged 55 years." Another unsung hero of the Spanish-American War. We hear so much about Teddy Roosevelt in Cuba, but so little about the career military officers who served there. Joseph Theodore Haskell of Ohio. Brevet Major, United States Volunteers, 13 March 1865 for meritorious services during the Civil War. Lieutenant Colonel, United States Volunteers, 2 April 1866 for zealous service in the War and Colonel, United States Volunteers, 26 November 1866, for faithful service. Mustered out of the Volunteer Service, 8 December 1866, and appointed Captain, 23rd United States Infantry, July 1866. Major, 24th United States Infantry, 28 June 1891, Lieutenant Colonel, 17th United States Infantry, 27 August 1896; Brigadier General, United States Volunteers, 7 September 1898; died 16 September 1898 of wounds received on 1 July 1898 at the battle of El Caney Cuba. Lieutenant Colonel Joseph T. Haskell, who was reported wounded in Friday's battle (Santiago, Cuba) has been singularly honored for meritorious conduct in his country's service. He was born in Ohio and appointed from that State Captain and Commissary of Subsistence on February 10, 1863. On March 18, 1865, he was brevetted Major of Volunteers for meritorious services in his department during the war. He was again brevetted on April 2, 1866 Lieutenant Colonel of Volunteers for "faithful and zealous service in the Subsistence Department." On July 28 of the same year he began his service in the Regular Army, being appointed Captain in the Twenty-third Infantry. On November 26, 1866 he received his third brevet promotion, that of Colonel of Volunteers, and on December 8 was honorably mustered out of the Volunteer Service, still retaining however his rank in the permanent establishment. His appointment as Major of the Twenty-fourth United States Infantry was made on June 28, 1892. He was advanced to his present grade of Lieutenant Colonel of the Seventeenth Infantry on August 27, 1896. 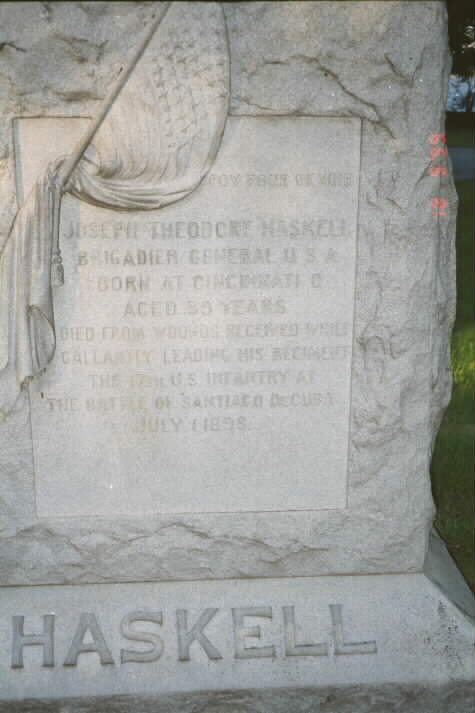 COLUMBUS, Ohio - September 16, 1898- Brigadier General Joseph T. Haskell died suddenly at his home at the Columbus Post at about 4:40 this afternoon. He was stricken with apoplexy, the excitement through which he had passed during the day being the immediate cause of the attack. General Haskell commanded the Seventeenth Infantry at the battle of El Caney, and was wounded in the left shoulder and knee. He came home about a month ago, and was rapidly recovering. THe wound, however, had paralyzed his left arm. This morning the Seventeenth Regiment returned home, and General Haskell went to the station in a carriage to welcome his men. He rode at the head of the regiment through the city to the post, and the cheers of the immense crowds of people that lined the streets were directed almost as much to him individually as to the regiment. At the reviewing stand the crowd surrounded the carriage, and flowers were fairly showered into the vehicle from every side. Although not assisting, as formerly, General Haskell appeared rugged, and his sudden death was a terrible shock to his family and friends. At 4:40 this afternoon Captain Clay called at General Haskell's residence to pay his respects. The General was resting at the time but came down stairs. They had been engaged in conversation about fiveminutes when General Haskell suddenly started to his feet, clasping his hands to his head, then fell to the floor. The only exclamation he made was "Oh! Oh!" Clay sprang to his assistance and was surprised to find his pulse has ceased to beat. Post Surgeon Pilcher was called and stated that the death was caused by apoplexy. 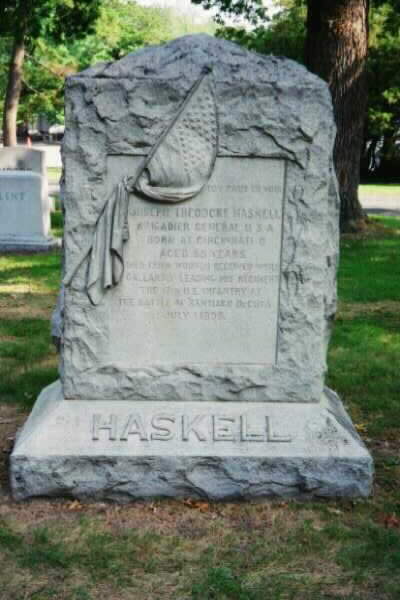 Mrs. Haskell was prostrated by her husband's death. Besides the widow, two sons survive. General Haskell was born in Cincinnati November 19, 1838. He was appointed a Captain and Commissary of Subsistence in 1863, and served throughout the war. For gallantry he was brevetted Major, Lieutenant Colonel and Colonel. He became Captain in the Twenty-third Infantry July 28, 1866,. and was promoted to Major of the Twenty-fourth on June 28,1872. He became Lieutenant Colonel of the Seventeenth Infantry August 27, 1896. From January 1869 to January 1872 he was in command of the San Juan Islands, which at that time were a none of contention between the United States and Great Britain. This matter was settled by arbitration, Emperor William of Germany deciding in favor of the United States. In 1883 he was appointed a member of the Tactics Board, and helped compile the military tactics which are now used by the army. From 1891 to 1898 he was a member and President of theBoard of Examiners of officers for promotion and was President of the board that examined non-commissioned officersseekingcommissions. When Colonel Poland was appointed Brigadier General at the outbreak of the war Lieutenant Colonel Haskell assumed command of the Seventeenth Infantry and led that regiment in the battle of El Caney, in which he distinguished himself for bravery. He led the regiment throught he succession of of barbed wire fences that surrounded the blockhouses at El Caney until he was shot. First a bullet struck his right foot. Soon afterward he was shot int he left shoulder and in another instant he received a bullet in his knee. Her emained therest of the day on the firing line, such attention being given to his wounds as the improvised hospital service provided. For his bravery at El Caney he was recently promoted to the rank of Brigadier General. WASHINGTON, September 20, 1898 - The remains of Brigadier General Joseph T. Haskell, one of the heroes of Santiago, who died at Columbus, Ohio, last Saturday, arrived here today over the Pennsylvania Railroad. The body of the soldier was laid at rest in the Arlington Cemetery this afternoon with appropriate military and Masonic ceremonies, in the presence of a distinguished gathering including President McKinley, General Miles, Adjutant General Corbin and other persons prominent in civil and military life.